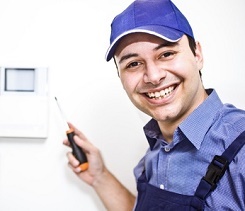 Solution: Alarm repairs can be much simpler than you think. If your alarm hasn’t been serviced for a while we would recommend getting it serviced, during which time we would attempt to repair any issues that might be preventing it from working properly. Often it just needs a new battery or re-setting. Most issues can be resolved for the price of a service (£68 + VAT) plus any parts or batteries. If you tell us what the problem is with the alarm, we will usually be able to make a reasonable estimate before we come out on whether we can fix it within that hour or whether it’s something more complex. Solution: This can often be true with ‘inherited’ alarms (alarms already installed in properties when you move in). Again, a simple service will make sure it’s in working order and our engineer would be able to show you how to use the system. Solution: We can usually restore the alarm to factory settings and allow you to assign a new code. Solution: We can replace standard sensors with pet sensors. These can distinguish between the different mass, shape and heat of people and pets and therefore wouldn’t be triggered by pets roaming around the house while you were out. Solution: If you can remember to lock the door then you should be able to train yourself to remember to set the alarm. A reminder sticker by the door can help, or something attached to your key ring so that you associate the two actions together. Solution: This can often happen in a household where there are multiple occupants or just if you’re a bit forgetful. You could try re-programming the code to something that is meaningful and memorable to all who use it (but nothing too obvious like 1234 or 0000) or if that doesn’t work how about swapping the panel for one that is fob operated? These can be attached to the same key ring as the door key so they should always be together (though be warned that this could potentially compromise security if the key ring is lost) or stolen. Solution: Well, what can we say! Maybe it seems like a hassle when leaving the house, or when coming in. Maybe you prefer to leave via a different door that is not close to the alarm panel or maybe you just don’t think it’s worth modifying your behaviour. We would encourage you to read our other blog on the importance (and logic!) of using the system you already have installed and paid for and how altering your routine by just 10 seconds could mean the difference between being burgled and not. Solution: If your alarm is in full working order then false alarms should be rare. If it is prone to false alarms then the best course of action is to have it serviced, which is advisable on an annual basis anyway. Solution: Potentially, but is it worth the risk? See our other #AlarmSetGo post for details on why this is the best thought-out strategy. Solution: Some people will be pretty good at setting their alarm when they go out but don’t bother when they go to bed because they don’t know how to do that. Our engineer would be able to show you how to do this or we may even be able to talk you through it over the phone free of charge (if you are already a customer). Don’t wait for a burglary! Hindsight is a wonderful thing. So many people don’t see the importance of using their burglar alarm until they experience some kind of break in. Trust us when we say you really will be kicking yourself if you get burgled when you had the system in place that could have prevented it and you just didn’t set it for any of the (easily resolved) reasons listed above. At this time of year, homes are particularly vulnerable to break ins with darker evenings and Christmas gift buying so if there was ever a good time to get your alarm sorted then it is surely now. previous Your burglar alarm: if you have one, use it! next Does an alarm need to be working to be a deterrent?